Drag-and-drop functionality is granted when you have write/push permissions for a repository in GitHub. If it is not working for you, is generating errors after you move an Issue, or not saving your changes, this is most likely due to lack of write permissions on the repository. Check to see if you have a purple banner on the bottom of your screen. If so, this means you have read-only permissions. Read-only permissions restricts what you can edit, allowing only for new Issue creation and commenting. To get push/write access to move Issues and manage the Board, ask an admin of the repository or of your GitHub account to grant you write access. If you're using a multi-repo Board, you might only have write permissions on some of the connected repos. If you accessed your Board from one of these repos where you have proper permissions, but are trying to move Issues that belong to a connected repo where you only have read permissions, you'll experiencing errors. To verify, use the repo switcherto go directly to the other repo and verify if the purple banner appears. If you don’t see a purple banner on the bottom of the Board, and were recently granted permissions to the repository but are still experiencing issues not saving when you move them, this means that your permissions have been cached. 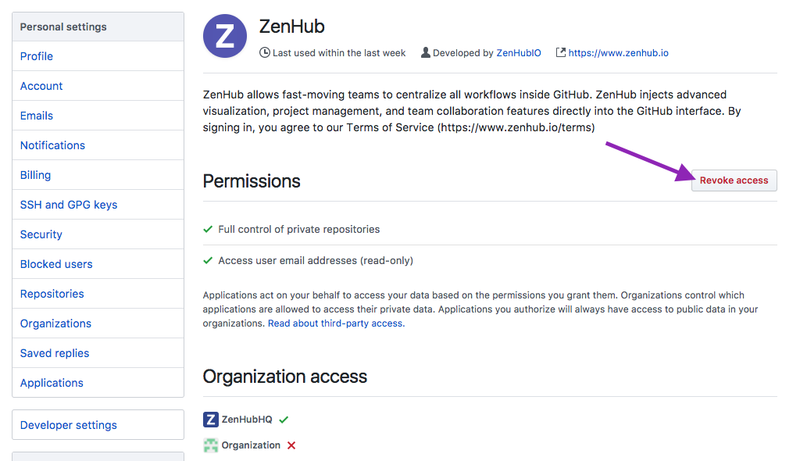 Permissions get checked every 3 hours, so if you were granted access within this timeframe, the quickest way to refresh your Board is to re-authenticate with ZenHub. To re-authenticate head to Settings > Applications > Authorized OAuth apps > ZenHub (Or click here to go to settings). If you click on the ZenHub title under the list of applications, there will be a Revoke access button. If you've verified permissions and are still experiencing issues moving Issues, get in touch with us.